#AkshayKumar is a force to reckon with, he is great onscreen and amazing in real life as well. He is noted for socially aware films; hence the actor has been awarded Social influencer at #Lokmat Maharashtrian of the Year. The celebrities of any film industry have a responsibility beyond just entertaining the masses. They have a responsibility as an influencer, of spreading awareness about relevant issues and providing a helping hand to solve those issues. And one actor from the Indian film industry who knows his responsibility well is Akshay Kumar. 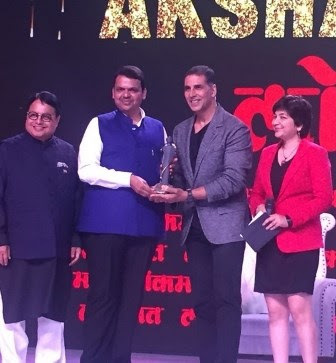 After delivering films such as PadMan and Toilet: Ek Prem Katha, the actor was awarded as the Social influencer at Lokmat Maharashtrian of the Year by Chief Minister Devendra Fadnavis. The Lokmat Maharashtra Awards were also attended by Hon CM Devendra Fadnavis, superstar Kareena Kapoor Khan, Kapil Sibal Former Union Minister, Piyush Goyal Minister of Railways & Coal, Ravi Shastri Head Coach of the Indian Cricket Team among others. On the work front, Akshay Kumar will be next seen in Reema Kagti’s Gold. The movie is about the first Indian hockey team to win the gold medal at the Olympics, after we got independence. The movie is produced by Farhan Akhtar and Ritesh Sidhwani under their banner, Excel Entertainment.